As a beautician professional you have good taste. An eye for beauty color and proportion. 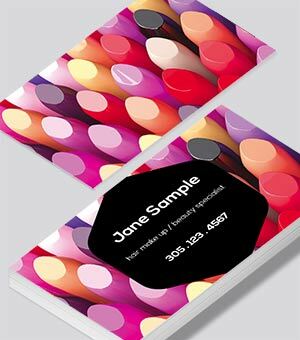 Why not present yourself with a tasteful business card that matches you? A small investment that goes a long way. All our designs are unique and not rehashed. With little effort you can customize any template to your personal preference. Upload a photo of yourself or your work. Print on gloss to make colors pop. In any case, you are sure to make an impact and an increase in your bottom line. 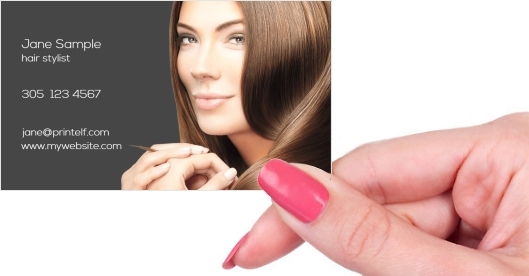 A very elegant design for the professional beautician. You have pride in what you do. Make this design work for you. Smooth soft colors work perfect for this theme. Wonderfully attractive colors make this design pop. Isn’t it all about that special “effect”? 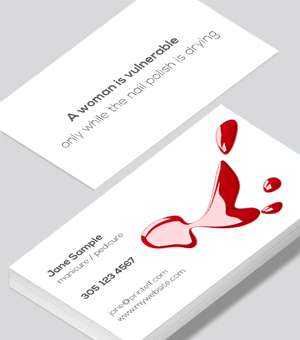 Any make-up artist needs a great business card. Why? You want to reflect your professionalism when handing out this card. This is one of two similar designs. The black background with the colorful lipstick create a strong statement. Black packaging is used in a lot of beauty products. 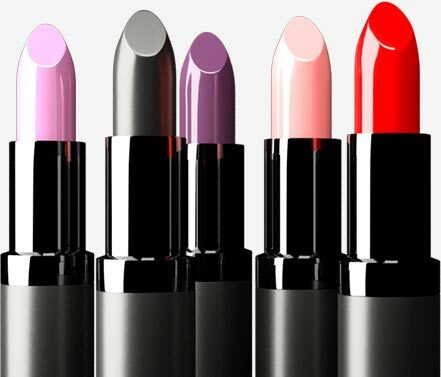 MAC, Giorgio Armani, Clinique, Sephora, Revlon and many more make use of the striking look. Use it to your advantage. This design, just like the black edition, make use of stark contrasts. A clean minimalist look oozes style and sophistication. Strong colors against white look simply wonderful. 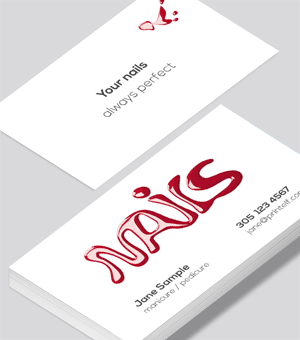 We think this design makes you look professional. Elegant and sophisticated. A design that speaks for itself, and for you. An image speaks a thousand words. Simply modify this template to your needs. Waves indicate motion, flowing brush strokes, waving hair and soft touches. 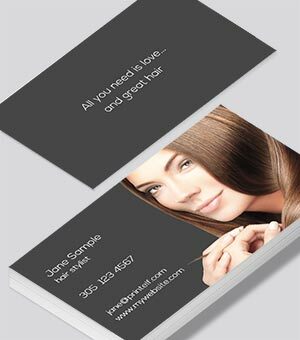 Whether you are a hair stylist, beautician or pedicure professional, this template works for you. 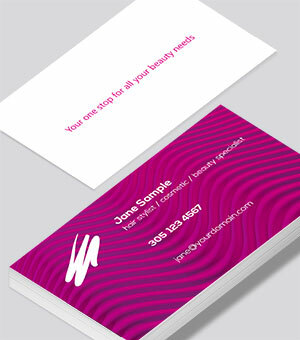 Hand out this business card and you are sure to get repeat business. Delightfully colored finger nails make a strong statement. We thought the slogan on the back makes sense for you. But, as with all our templates you can modify them to your hearts desire. A very elegant look for the talented beautician. You are in the business of making people happy and feeling great about themselves. Make it a habit to spread your contact information and business will incease. 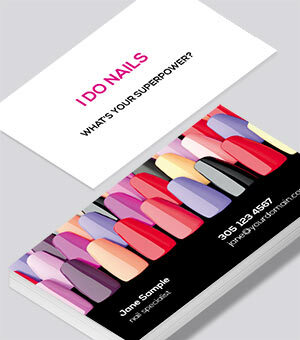 This template is sure to attract attention for the manicure and pedicure technician/artist. An image that speaks a thousand words. As all designs, exclusively created for you. Update or modify to your needs. Don’t go for boring and the expected. Mimicked spilled nail polish works great for this design. Its memorable and witty. 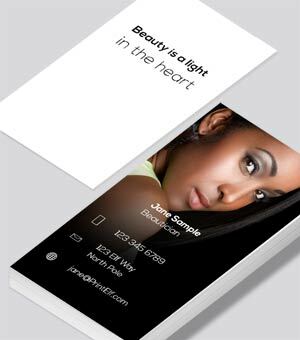 Most importantly, an unforgettable business card will bring you new and returning customers. 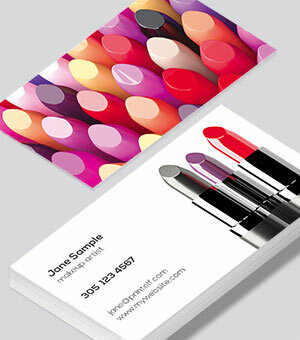 Business cards are a basic marketing tool no beauty technician can be without. It is also the least costly expense when doing business. The impact however is significant. 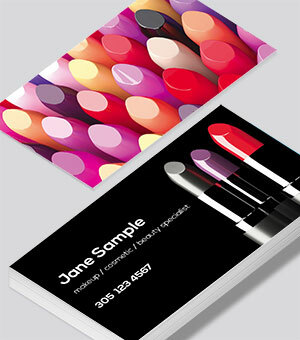 A flimsy badly designed beauty business card speaks volumes. Give it some love and you will reap the benefits. Let us know if you have any requests. We love to hear success stories from our valued customers. Not a hair stylist, nail technician or beauty professional? We have created a lot of designs for you. You can only find them right here at PrintElf. Each template is created with love. You can easily customize to your personal taste. 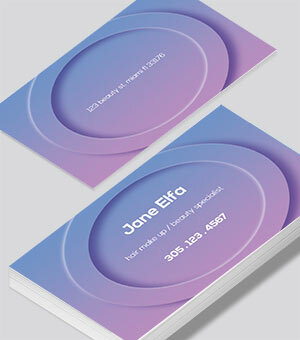 Pick one of our templates from our expanding selection. Once at the Online Designer you can make simple quick changes or modify to your hearts desire. If you have a design you can upload it as well. Click the [Review & Purchase] button. You will see pricing for paper selection and quantity. You will also see a preview of your new design. You can also save your design and purchase at a later date. Don't worry about hidden costs! Full color on both sides, glossy or matte and free shipping are all included! So what are you waiting for? We are passionate designers. Let us know if you have any questions or concerns. For a nominal fee you can also hire us to design your special project. We are right here in the USA, ready for you.